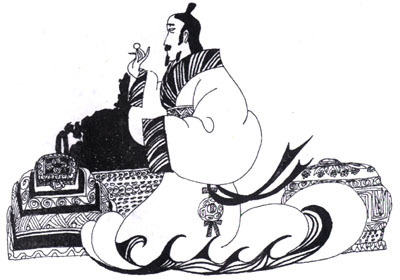 A man from the state of Chu (chǔ guó 楚国) wanted to sell a precious pearl in the state of Zheng (zhèng guó 郑国) . He made a casket for the pearl out of the wood from a magnolia tree, which he fumigated with spices. He studded the casket with pearls and jade, ornamented it with red gems and decorated it with kingfisher feathers. A man of the state of Zheng bought the casket and gave him back the pearl. Too luxuriant decoration usually supersedes what really counts. This man from Chu certainly knew how to sell a casket but he was no good at selling his pearl. And the man of Zheng didn't know which is really valuable. 【翻译】Getting the casket and returning the pearl.